Chronic Kidney Disease, referred to as renal disease, is when the kidneys are no longer able to completely remove waste products from the blood, allowing toxins to build up in the bloodstream. This can be due to disease, a hereditary condition of the kidneys, obstruction of the urinary tract, lymphoma, diabetes, certain plants and prescription medicines. Ethylene glycol, an ingredient in antifreeze, can cause acute renal failure. The kidneys regulate blood pressure, blood sugar, blood pH and other bodily functions, so the effects of the disease affect most of the systems of the body. Normally, kidney disease cannot be reversed or cured, therefore, emphasis is generally on slowing the progression of the disease. Early detection is key to slowing the progression because the disease is serious and can eventually become life-threatening. Symptoms can include lethargy, vomiting, diarrhea, increased thirst, depression and possibly seizures. Signs to be aware of are drinking more water than usual, urinating more frequently (with possible blood in the urine), decreased appetite and weight loss. Acute blindness is also a possibility. Cat breeds genetically predisposed are the Abyssinian and Persian. 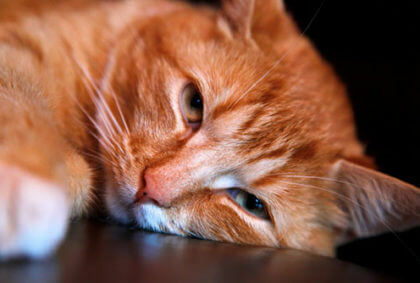 Kidney disease is more commonly found in older cats, most often showing up around the age of 9. Cats are nearly 7 times more likely to develop kidney disease than dogs. Dog breeds predisposed to Kidney Disease are the Bull Terrier, Cairn Terrier, English Cocker Spaniel, German Shepherd and Samoyed. Kidney disease is more commonly found in older dogs, most often showing up around the age of 7. Most often, fluids will be given to rehydrate the pet and a change in diet will be prescribed as well. The prescribed food needs to be low in protein, phosphorus and calcium; additionally a sodium that is higher in potassium and certain omega fatty acids is also needed. Medication will be prescribed, as needed, to raise (or lower) the pet’s blood pressure, and to help control vomiting, diarrhea and anemia. Stem cells can restore some of the kidney function that has been lost. Depending on the severity of the condition and when the treatment is given, the kidney values may return to normal or close to normal. Treatment may be injections directly into the kidney or IV injections. Pet’s with kidney disease need to be observed on an ongoing basis for possible adjustments to their diet or medication.